For those who don't know about my project, Aspire To Inspire, you can check out the previous magazine and the Web Series. Basically a quick run down on ATI is that it's a place of which I share stories and talent, a place in which I am able to collaborate with positive inspirational people within the industry, whether that be bloggers or musicians or YouTubers or anyone who has a talent offer and a story to tell. I am open to work with anyone I believe represents what ATI is about. You can check out the previous magazine I did here. 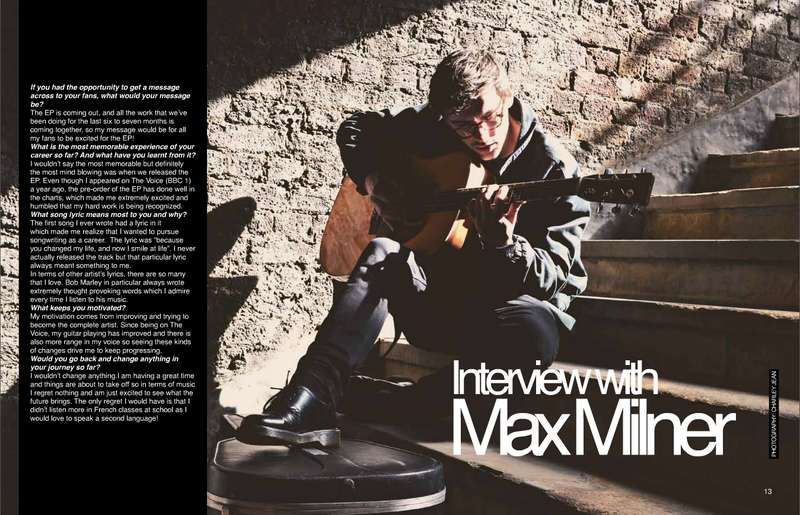 I did this magazine back in UNI and I was super proud of myself for reaching out to some of the artists within this such as Max Milner from the BBC show The Voice. This allowed me to see that reaching out to anyone I wanted was possible and this lead me to go on to create a Web Series on YouTube and continue to collaborate WorldWide with YouTubers, Musicians and talented people and I will now continue to do this. I decided six months ago with the content off my series going well and people appreciating what I was doing and collaborating and believing in my project it was time to again do another magazine. I could of done this magazine in a number of different projects but I thought why not have a 100 page product with inspiration and positivity for people to share amongst themselves and read, so thats what I did. For this magazine I worked with two sponsors which was something different to Issue One as I used my own brand that I designed in UNI. This time around I worked with Mous Cause, which is an incredible innovative brand that design iPhone cases that stop you having to deal with tangled headphones, so that was cool. I also worked with my clothing brand USH and I hope this enables me to go on to work with brands further in my career. Another thing I am incredibly proud of is the two bloggers I got to collaborate with in this Issue. When I first started ATI I didn't have this blog and I was happy to incorporate this new aspect of my life into the magazine and share this world a little bit more with you guy's. One being last years Cosmo Blogger Award winner Gracie Francesca from Ugly Face Of Beauty and the other being Carrie from the popular blog which is WishWishWish. Read Aspire To Inspire Issue 2 Here. | Read Aspire To Inspire Issue 1 Here. Watch ATI WEB SERIES HERE.